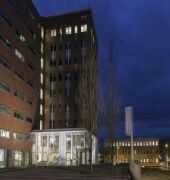 Conveniently connected to the airport, Amsterdam Identity Apartments is in Amsterdam (Amsterdam West), close to Sint Lucas Andreas Hospital, Sloterpark and Sloterplas, and Rembrandt Park. Also nearby are Anne Frank House and Vondelpark. 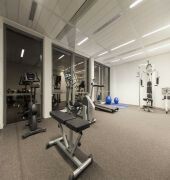 Amsterdam Identity Apartments has a sauna and a fitness center. Wireless and wired high-speed Internet access is complimentary in public areas. Additional amenities at this Art Deco hotel include multilingual staff, tour/ticket assistance, and laundry facilities. Onsite parking is offered for a surcharge. This is a smoke-free property. The 55 guestrooms at Amsterdam Identity Apartments include laptop-compatible safes and coffee/tea makers. Guests can use the in-room complimentary wired high-speed Internet access. Televisions are equipped with premium digital channels. All accommodations provide desks and phones. All units at this 3-star hotel have kitchens with microwaves, refrigerators, dishwashers, and cookware/dishes/utensils. 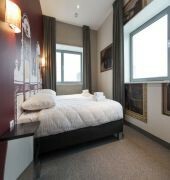 The AMSTERDAM IDENTITY APARTMENTS is a Tourist hotel. Located in AMSTERDAM area. Shopping is accessible by bus/taxi and the nightlife/restaurants are easily accessible by taxi or bus from the hotel. 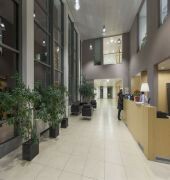 Descriptionclass="small" style="text-align: justify; font-size:11px;">Conveniently connected to the airport, Amsterdam Identity Apartments is in Amsterdam (Amsterdam West), close to Sint Lucas Andreas Hospital, Sloterpark and Sloterplas, and Rembrandt Park. Also nearby are Anne Frank House and Vondelpark. 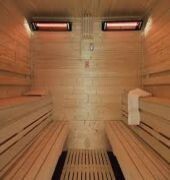 Amsterdam Identity Apartments has a sauna and a fitness center. Wireless and wired high-speed Internet access is complimentary in public areas. Additional amenities at this Art Deco hotel include multilingual staff, tour/ticket assistance, and laundry facilities. Onsite parking is offered for a surcharge. This is a smoke-free property. The 55 guestrooms at Amsterdam Identity Apartments include laptop-compatible safes and coffee/tea makers. Guests can use the in-room complimentary wired high-speed Internet access. Televisions are equipped with premium digital channels. All accommodations provide desks and phones. All units at this 3-star hotel have kitchens with microwaves, refrigerators, dishwashers, and cookware/dishes/utensils. Well what a great stay. 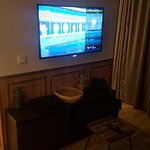 Lost my passport and they were very understanding and helpful, even helped me scan photos to my email, would highly recommend, the room was clean and tidy and felt very homely, if I find myself in Amsterdam again I would absolutely stay again. Ideally located for public transit and basic amenities. The staff at the desk are very friendly and helpful. Laundry facilities, fitness centre and sauna are a nice touch. The restaurant located in the lobby has good food and nice ambiance. Would definitely recommend for anyone who wants to be close to the city centre without paying city prices. Room - Fantastic. 2 bedrooms and 2 bathrooms and a kitchen/dining area and a lounge. The room felt like a suite in a hotel and I was really happy. The fittings were all new and the place was very clean. Location - It's a little bit away from the centre but only a few minutes on the sprinter train to Amsterdam central and the excellent tram networks meant it never took more than 30 minutes to get to where we wanted to go. Definitely get the multi-day travel pass if you stay at this hotel. Price - Incredible value, ended up costing Â£200 for 2 nights, which considering it could have slept 4 people is incredible value. One last side point, the staff were so polite and excellently informed. Loved the atmosphere of the hotel and the personalities of all working there. Couldn't recommend this place higher. Me and my partner stayed here for 5 nights at the end of March start of April and I have to say it was the best hotel we've stayed in so far. I had a few requests made prior to arrival as it was my partners birthday and everything that I had asked was done to the highest standards, which definitely got me my bonus points! Thanks to Rudith for that! Everything was so quick and easy on arrival, the staff were exceptional and so hospitable, which is exactly what you expect when you arrive to a hotel on holidays. The best thing about this hotel is along with all your normal amenities, you have your own kitchen in the room, which is perfect for those people who like to self-cater! I honestly recommend it so much! We only had breakfast one of the days, as im not a morning eater, but couldn't have been happier with the quality of food, the scrambled eggs are a must have! Unfortunately didn't try anything from the dinner menu, but our barstaff were very nice with us when we were getting our drinks. Throughout the stay I had a lot of questions and every one of the staff couldn't have helped us more. Even though the hotel isn't in Central Amsterdam and is just outside, I found it to be the perfect spot as its situated 5min walk from Sloterdijk Station. Sloterdijk Station is 2 stops from Schipol Airport, so when you arrive by plane, you're at the hotel within the hour ready to relax. It is around a 20-30 minute tram into the town, unfortunately the metro wasn't operating for 3 of the 4 days we were there so made the trams more busy. We didn't do much around the hotel area, but theres a nice coffeeshop chain nearby, Boerejongens, so that was handy if you're there to try that. Overall the experience in this hotel has made me forget about any bad experience I've had previously in other hotels, I have to say kudos to the staff for making it that bit better aswell! We just got back from a three night stay. What a lovely hotel/apartment. Rooms a good size and have everything you need, we stayed in a two bed apartment. Staff really friendly and helpful. We was worried about staying out side of central but it is perfect so easy to get to and back. Train station is short walk (3mins) donâ€™t follow google maps when trying to find the entrance just head to the Mercure and your see the sign.